The first F-35s have landed on the flight deck of HMS Queen Elizabeth during tests being conducted off the east coast of the USA. 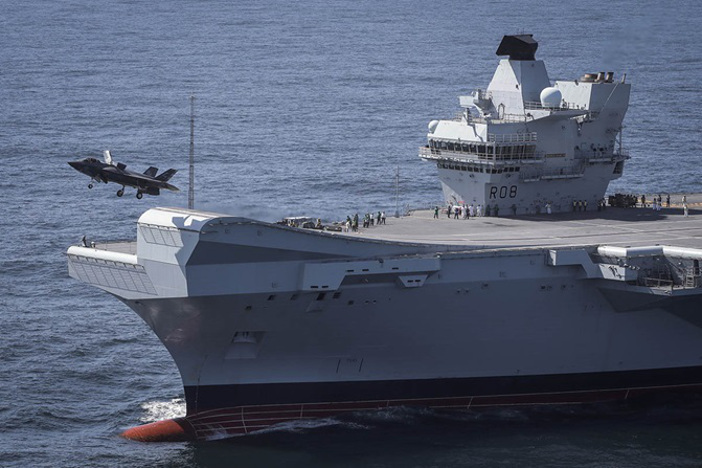 The take-off and landing marks the return of the Royal Navy’s capability to operate fast fighter jets from an aircraft carrier. Royal Navy Commander Nathan Gray and RAF Squadron Leader Andy Edgell were the first pilots to land their F-35 Lightning stealth jets on the flight deck of the UK’s newest carrier on 25 September 2018. Shortly afterwards, Commander Gray became the first pilot to take off using the ship’s ski ramp. The fighter jets are being flight tested over the next three months in a range of sea and weather conditions. More than 500 flights are scheduled to take place during the test program. Commander Gray said, “No words can explain how it felt to turn the corner at 500mph and see HMS Queen Elizabeth awaiting the arrival of her first F-35 jets. I feel incredibly privileged. One of two aircraft carriers recently launched by the Royal Navy, HMS Queen Elizabeth can embark up to 24 F-35Bs. In an eventful week for the F-35B, the aircraft also saw active service for the first time in Afghanistan and crashed for the first time. The pilot safely ejected from the aircraft before the impact. The incident, which happened near Marine Corp Air Station Beaufort in South Carolina, USA, is being investigated.